Tour to Launch February 9 in Uncasville, CT. Tickets On Sale in Select Markets Beginning November 30. As Bon Jovi gears up for a monumental year, the all-American rock icons have announced the first set of U.S. dates, taking them from coast to coast on their “BON JOVI Because We Can – The Tour.” The tour will kick off in Uncasville, CT on February 9, treating fans to one-night-only performances in U.S. arenas nationwide, plus multiple stadium shows including a two-night stand at MetLife Stadium in the band’s home state of New Jersey. Overwhelming demand for the band’s previously announced Canadian dates has already led to second shows in Montreal and Toronto, and Bon Jovi has plenty more in store. The band will expand their current tour schedule with additional North American dates including Gillette Stadium in Foxboro, MA; Ford Field in Detroit, MI, and many more. The current tour itinerary is listed below, with further details to come. View U.S. tour announcement video here. 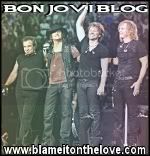 The tour, promoted by AEG Live in the U.S., Canada and the U.K., will debut brand new songs from Bon Jovi’s upcoming album What About Now, to be released in Spring 2013, loading even more ammunition into the band’s huge arsenal of hits. The group’s return to the road in 2013 will launch the latest chapter in an ongoing blockbuster run which has already secured Bon Jovi’s status as the essential live rock band – having performed more than 2,700 concerts in over 50 countries for more than 35 million fans. “BON JOVI Because We Can – The Tour” will make its way across the globe with dates in Europe, the Far East, Africa, Latin America and Australia.